CONOR McGREGOR was told he had “nothing to be ashamed of” by boxing great Lennox Lewis and several others came out in support of the Irishman as the dust started to settle on his round-10 loss to Floyd Mayweather in Las Vegas. The UFC star was not expected to last longer than a round by many on his boxing debut, particularly given his opponent is one of the greatest fighters of all time. 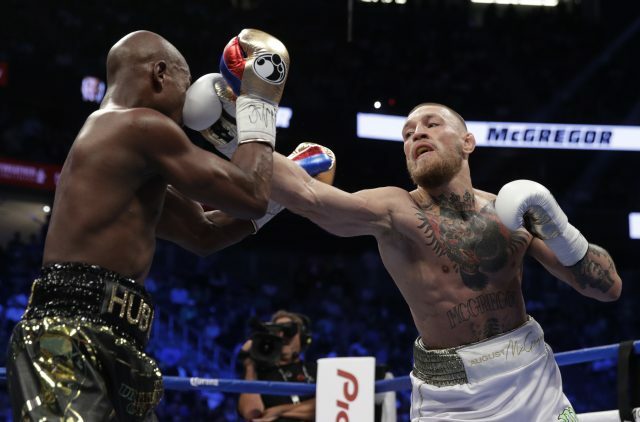 But going to the 10th round has earned him plenty of credit, particularly on American soil, with the bout described as “amazing” and McGregor praised for making the notoriously cagey Mayweather open up. Here, Press Association Sport rounds up some of the best social media reaction to the mega-fight. Conner kept it interesting but he was outboxed and outclassed in the square ring. Nothing to be ashamed of tho. I like him even more now! ???????? FM executed his plan perfectly &took CM 2deep waters. CM was game &I have respect 4what he tried 2do. Will be a superstar going forward! I’m not mad that I stayed up all night to watch this fight. ???????????????????????? @FloydMayweather is definitely TBE!!! @TheNotoriousMMA Much Respect!! Really brave effort from @TheNotoriousMMA but @FloydMayweather is a true champion of his sport. Damn good fight. Mayweather put on a hell of a show. Conor did much better than I had expected. Hats off to both guys. Worth the money ????
. @FloydMayweather is so precise????. Bravo good sir. @TheNotoriousMMA ran out of gas but I like that he wanted to keep going even if KO. ???? Can’t remember the last time a fighter has made Floyd fight… Floyd is fighting and is very much alive. That was an amazing fight to watch!